In light of Iranian President Mahmoud Ahmadinejad's recent visit to the United States and the level of repression in his coutry, it is a good time to be reminded of the fact that intellectual freedom is afforded to very few of us in th world. For example, The Da Vinci Code, one of the best selling books of all time, is banned in Iran because the book is based on the theory that Jesus married Mary Magdalene, with their descendants surviving today. A 2000 US government report said that Myanmar (Burma), where nine anti-government protesters were kiled by the police Thursday, bans all Bible translations into local indigenous languages. Books by peace activist Aung Sang Suu Ky, Freedom from Fear and Letters from Burma, are also banned in the southeast Asian country. The author was under house arrest in Myanmar, during the original publication of the first book, and neither book is published or distributed in Myanmar, where the author still lives. Even in the United States, where there is very little censorship, it is hard to imagine a time when some of the most prolific writers - Walt Whitman, James Baldwin, John Steinbeck, Toni Morrison, Ralph Ellison, Jack London, Ernest Hemmingway and Maya Angelou - have all had their books banned or challenged at some point. Freedom of expression is noting to be taken for granted. There is no amount of gratiture that can be given to those who have made it possible for authors, writers, journalists, poets and even bloggers to say what we want to say today with impunity. With that said, the American Library Association has several ways to celebrate this week on their website. 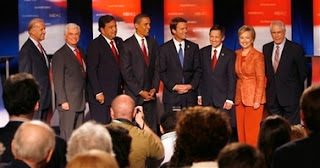 This week Americans went through another round of debates by both the Democratics and Republican presidential candidates. It could easily be concluded that both parties don't care about the interests of American people. For example, the Democrats were elected in sweeping numbers into both the House and the Senate on the mandate that they will pull the troops out of Iraq. Barack Obama: I think it's hard to project four years from now, and I think it would be irresponsible. We don't know what contingency will be out there...I believe that we should have all our troops out by 2013, but I don't want to make promises not knowing what the situation's going to be three or four years out. Hillary Clinton: Well, Tim, it is my goal to have all troops out by the end of my first term. But I agree with Barack. It is very difficult to know what we're going to be inheriting. You know, we do not know, walking into the White House in January 2009, what we're going to find. What is the state of planning for withdrawal? John Edwards: I cannot make that commitment. At least Edwards kept it short and to the point. 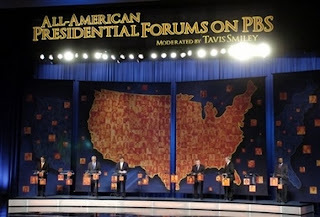 Unfortunately the second and third tier candidates - Richardson, Dodd, Biden, Kucinich and Gravel - actually advocated an immediate pull out, but because they are not getting the big corportate bucks, they might as well be invisible. Something that resembled a Republican debate specifically geared towards issues relating to people of color took place last night at the historically black Morgan State College. But apparently none of the top GOP contenders - Giuliani, Romney, McCain and Thompson - showed up due to "scheduling problems." This is very hard to believe, as this event was planned a year in advance, and all the candidates agreed to attend. The running theory is that since most African Americans don't vote for Republicans, why would the candidates attend an event where their views on such controversial ideas as Affirmative Action and criminal justice might be attacked. But isn't it the job of a president to defend their beliefs? If a Republican is elected in 2008, he will not just be the president of the white, heterosexual, Christian United States of America. Again, the lower ranking candidates, including a "special appearance" by Alan Keyes, who had nothing to lose, made the effort to show up. "Fortunately, there are those in the Republican Party who do understand the importance of reaching out to people of color," said talk show host Tavis Smiley, the debate moderator, thanking the six other candidates for participating. A total disappointment...When will the American people stand up against this nonsense. Will the real gay rights advocate please stand up? "...Human rights are being extensively violated by certain powers..."
Iranian President Mahmoud Ahmadinejad has been in New York for the last few days causing a stir everywhere he goes. Ahmadinejad was invited yesterday to speak before students and faculty of Columbia University. Along with his anti-Semitic conspiracy theories and wavering views on Iran's nuclear power, apparently there are no gays in his country either. "In Iran we don't have homosexuals like in your country," Ahmadinejad said. "In Iran we do not have this phenomenon, I don't know who has told you that we have it," he said. When you think about it, this might actually be true to a certain degree, considering the 200 people executed in Iran so far this year, according to a Amnesty International report, and the hundreds more living in self-imposed exile in Europe and North America. "It is extremely unfortunate that the President of Iran, who used a prestigious academic forum to speak the "truth" about his country, nevertheless spoke so disingenuously about the human rights situation in Iran," said Paula Ettelbrick, Executive Director at The International Gay and Lesbian Human Rights Commission (IGLHRC). "The Iranian President's stark denial of our reality reflects his government's ongoing refusal to recognize the basic human rights of LGBT people." However, it's a certain Republican who is also making shock waves. "I think it is an outrage for the university to lend its prestige to a dictator whose Government executes homosexuals, tortures and kills journalists, lock up students," said for US Speaker of the House Newt Gingrich. While no sensible social activist would support the human rights violations going on in Iran, it does seem a bit convenient for Gingrich and other Republicans to become pro-gay when they need to push US foreign policy down the world's throat. Mr Gingrich, before you start to dictate the world about rights violations, please look at America's human rights record first. Everything from Abu Ghraib, the Iraq invasion, Hurricane Katrina and even Jena 6 points many fingers at how the current day America wrongly operates. As far as gay rights are concerned, Mr Gingrich, when did you speak out against the murders of Matthew Shepard, a gay college student, or African American lesbian Sakia Gunn? Furthermore, it is people like yourself and the Republican Morality Police who force people like former US Senator Larry Craig to go into deep denial about their own sexuality. Mr Gingrich, maybe you should join Mr Ahmadinejad in the corner with a dunce cap.